That is not to say this trilogy-capper is a perfect film, or even necessarily a great one. I still think The Hobbit movies, even at their best, pale in comparison to what Jackson and company achieved with The Lord of the Rings, and while The Battle of the Five Armies is a conspicuously better film than the first two, it is hardly free from many of the flaws that plagued them. But there is an emotional resonance to this film, from first frame to last, that frankly took me by surprise. I found myself caring about the extended cast of characters here in a way I never anticipated, powerfully moved not only by the small-scale interactions between characters, but by the overall tapestry woven by Jackson and his team. There is spectacle on display here that rivals or surpasses any film in recent memory, and Jackson’s ingenuity for staging vast, intricate battle scenes remains absolutely unparalleled. Yet that’s not what makes this film work; like The Lord of the Rings, it lives and dies on strength of character work, and here, the method to Jackson’s three-film madness emerges. After two films spent establishing the cast and putting various pieces in place – sometimes thrillingly, sometimes tediously – Jackson finally tightens the strings and brings everything together, and the resulting pay-off is immense. It may not approach the sheer emotional peaks of The Return of the King, but for the much smaller story that is The Hobbit, Jackson has wrung a palpable power out of the material, a sense of resolution, catharsis, and satisfaction that is, in its own way, rather remarkable. In several different moments, and for whole stretches of film, I felt here the magic I see in The Lord of the Rings – and, by extension, in cinema itself. And that is no small feat. One of the film’s bigger surprises, for me, comes at the very beginning. The Battle of the Five Armies begins with Smaug’s destruction of Laketown (minor spoilers from here on out, for events recounted in a 77-year-old book), a sequence I felt was bafflingly missing from the end of the previous film, and which I seriously doubted could serve as an adequate starting point for a separate movie. Amazingly, though, Smaug’s attack upon the lake people is a perfect introduction, a rousing and awe-inspiring note that sets the tone for everything to come in more ways than one. Smaug’s attack on the lake and subsequent defeat is the instigator for all forces in the eponymous Battle of Five Armies, of course, but more importantly, this sequence establishes the pattern that comes to make the film as a whole so engaging: Taking the raw materials of a previously introduced character, and turning them into something hugely compelling. Bard’s ascension to heroism over the course of the sequence, and the terrific work Luke Evans does illustrating the character’s interior and exterior struggle, is one of the most exhilarating things I have seen on film all year (his standoff with Smaug, again voiced to perfection by an inspired Benedict Cumberbatch, will send waves of chills down one’s spine). From there, the character only becomes increasingly interesting, as he takes up the mantle of leadership for the people of the lake, and finds himself taking part in a battle he never wanted or expected to fight. So it goes for all major characters in the film. 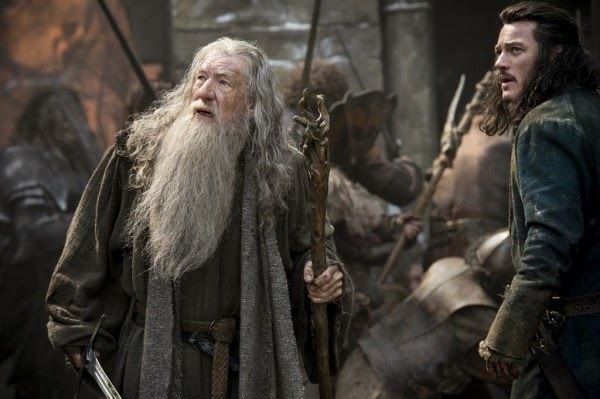 Whether it is a familiar face like Gandalf (Ian McKellan) we have long-since come to love, or an intriguing but unproven figure like elf king Thranduil (Lee Pace), The Battle of the Five Armies transforms its characters through extraordinary circumstances, putting them all in extreme situations and revealing layers about each in the process. 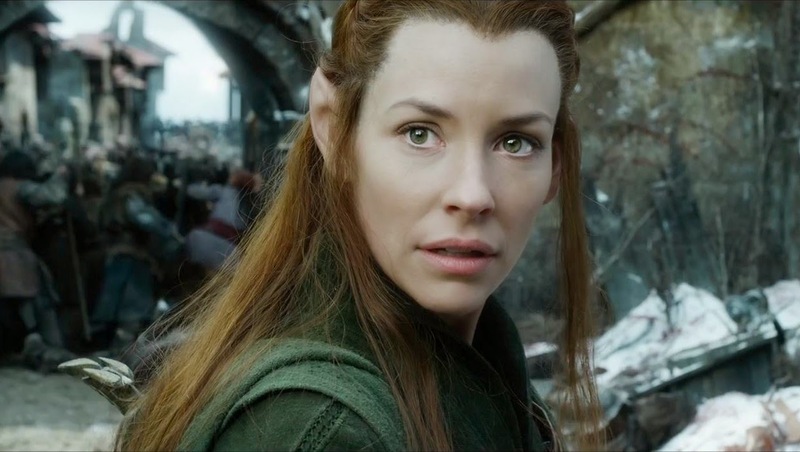 The relationship between Evangeline Lilly’s Tauriel and Aidan Turner’s Kili goes from being a bit of a head-scratcher to an emotional cornerstone of the film, an unlikely romance that informs so many of the movie’s themes, and imbues much of the action with an added layer of resonance (Lilly herself remains the major discovery of this trilogy, once again giving a radiant movie star performance that should, by all rights, vault her to superstardom). 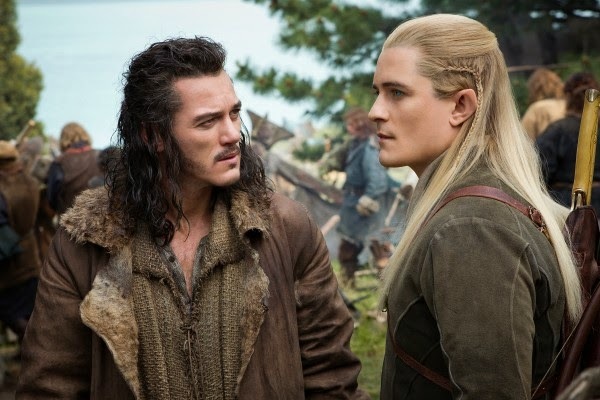 Orlando Bloom’s Legolas is given a more substantive character arc than he had even in Lord of the Rings, and one of the great joys of the film is watching Jackson and Bloom gradually transform this character into the elf we knew in those earlier films – a trick many prequels attempt, but rarely pull off. And most importantly, the trilogy’s two protagonists – Bilbo Baggins and Thorin Oakenshield – are not only given revelatory material to play, but placed firmly at the center of all the film’s action. My biggest complaint about the first two Hobbit films was how often Bilbo got sidelined, if not forgotten entirely. It’s not just that Bilbo is the clear protagonist of Tolkien’s novel, but that without a character at the center of things, those films felt aimless and unfocused in a way The Lord of the Rings never did. Here, Jackson has rectified that almost entirely. It isn’t that Bilbo necessarily has more screen time than before, but that Jackson and company have constructed the entire narrative around him – or, more accurately, around Bilbo and his relationship with Thorin. Stricken by ‘dragon sickness’ amidst the piles of gold within the Lonely Mountain, Thorin has effectively gone mad, and Bilbo is trying everything in his power to bring his friend back to reality. The overall ‘plot’ of the film is bigger and more complex than that, but everything that happens, both leading up to the eponymous battle and during it, stems outward from that central character dynamic. Martin Freeman and Richard Armitage are as fantastic as ever – have I any words left to describe what perfect casting Freeman was, or how fierce and palpable a soul he imbues into every fiber of Bilbo’s being? – and since these are the two figures Jackson’s trilogy has devoted the most time to developing, that means there is a powerful core of pay-off at the heart of the film, one that radiates outward to make everything else feel more significant. By the time Bilbo and Thorin reach their last scene together, it is almost overwhelmingly emotional, and I think Jackson makes some very smart choices in wrapping up Bilbo’s journey by viewing it through the lens of this incredible dwarf he came to befriend. With this firm character-based center, The Hobbit proves itself to be quite dramatically adept indeed; one wonders how great the first two films might have been had they the clear, confident structure of this one. It is a structure that gives Jackson license to do what he does best: Staging action on a vast and intricate scale, fueled by a well-developed cast of characters that makes it all impossibly gripping. The prior Hobbit films have only solidified how creative Jackson is when it comes to staging major set-pieces, but The Battle of the Five Armies is a reminder that nobody, across the whole of film history, is better at crafting sweeping, interconnected battle sequences. There is such incredibly clarity to the way Jackson lays out and employs space, or how deftly he ratchets up the stakes and tensions as the battle goes on and intensifies, that he makes it look easy. I don’t think this is quite as thrilling or accomplished as the Battles of Helm’s Deep and Pelennor Fields, necessarily, but Jackson relishes every opportunity for imaginative, large-scale action, and I find it amazing how he takes these short, fleeting descriptions from Tolkien’s work and expands them to become major moments of visual invention and character pay-off. Jackson is especially good at keeping battles like these grounded in character, and that is ultimately what allows The Battle of the Five Armies to soar – every thrill is a mixture of visual spectacle and character development, and by the end, the cheer-worthy moments start piling up high. The film has its problems, certainly. There is a recurring comic-relief character here I found entirely extraneous, and while the technical merits are largely first-rate all around – Howard Shore has a field day playing with the musical opportunities the battle affords him – I still find myself troubled by the amount of CGI on display. As expertly-staged as everything is, The Hobbit films are vastly less tangible than The Lord of the Rings, and the reason is simple: Nearly everything in the earlier trilogy was practical, and nearly everything in the new trilogy is artificial. 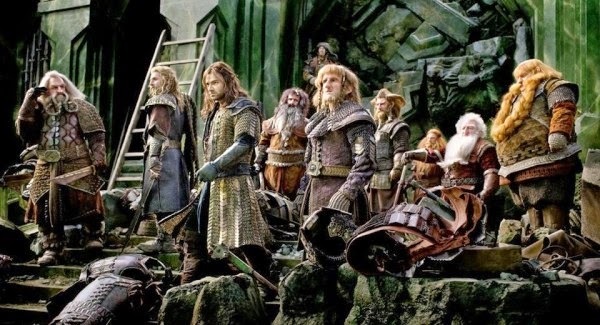 I understand that there are plenty of wondrous sights here that could hardly be achieved without the assistance of digital technologies – you could never ‘shoot’ Erebor out in the real world, for instance – but Jackson has gone too far overboard here, as he did in the other Hobbit films, and it keeps me at a distance from the film at all times. There are several moments where it just seems plainly obvious that actors are standing on a green-screen, utterly detached from the digital mayhem unleashing itself around them, and it works against the ideally immersive qualities of cinema. At the very least, I wish Jackson had gone the practical route with Azog, the primary antagonist of these films; it is a stupid-looking design to begin with, and the CGI, good as it is, makes him a less-than-compelling foe whenever he appears. Lurtz, the big Uruk-hai from The Fellowship of the Ring, left more of an impact in his scant screentime in that film than Azog has over three long features, and given Azog’s centrality to the entire trilogy’s climax, the decision to render him digitally was a major mistake. Yet my biggest point of contention with The Battle of the Five Armies, and one that I am still grappling with, is the surprisingly low-key way Jackson chose to wrap up this trilogy. The complaints about The Return of the King having too many endings are foolish ones, for the film was the conclusion to a nine-hour-plus story, and paying off on all the characters and themes of the trilogy demanded letting things linger. With The Hobbit, Jackson may have gone too far in the other direction, streamlining things so much that I felt surprisingly little impact walking out of the theatre. Bilbo says his farewells to the dwarfs, has a final exchange with Gandalf, returns to the Shire and … that’s about it. None of the material is bad – in fact, it’s all quite touching, each scene wonderfully written and performed, all of it very affecting in its own way. I especially like the way Jackson lingers on Freeman’s reaction to his Hobbit hole upon returning, wordlessly suggesting how much the character has been through, and how much he has evolved. But somehow, in a way I cannot quite put my finger on, the ending feels less than whole, like the conclusion to a much smaller, less sprawling version of this story. When the credits rolled, I felt a bit hollow, as if, after nine hours of film, Jackson had failed to provide a specific denouement, a moment that would underline the purpose and meaning of the trilogy. The Return of the King had plenty of those, on scales both macro and micro. The Battle of the Five Armies has several excellent grace notes at the end, but no real punctuation point. And as much as I had enjoyed the film up to that point, it left me feeling emptier than I would have liked. This, then, leads us to the first of two major questions we must now ask, having come to the end of this journey with The Hobbit. First: Was the expansion to three films necessary to fully tell this story? My thoughts on this are complex, and shall no doubt evolve over time, but in this moment, I lean towards answering ‘no.’ I think The Hobbit films have done many, many things well, and the amount of resonance on display in The Battle of the Five Armies could only exist with properly laid groundwork. There is certainly a cumulative effect to the films, and I see why, given how rich much of this concluding feature is, Jackson felt the temptation to expand his story to another full trilogy. But that expansion also had its downsides, and I think that is why I felt so hollow coming to the end of this journey. The ending Jackson devised here would be rather perfect for a smaller, more faithful adaptation of Tolkien’s text; ballooned out to three films and encompassing so many more characters than just Bilbo Baggins, with numerous attempts to connect the modest story of The Hobbit to the major tale of The Lord of the Rings, I doubt there is any ending that could appropriately summarize the sprawl of this trilogy. The first two films spent so much time putting pieces into place for the story of The Lord of the Rings, and while that prequel-heavy content is lessened here (there is one standout sequence in Dol Goldur that plays like the world’s greatest fan-fiction), the effect of all that extraneous storytelling is to saddle The Hobbit with weight it need not carry. This is not the story of the reawakening of evil in Middle Earth. This is not the tale of a major, broadly defining moment in the fictional world’s history. This is the story of Bilbo Baggins’ unexpected adventure, and of his unlikely friendship with Thorin and the dwarfs. And while The Battle of the Five Armies wisely course-corrects to hone back in on that fundamental through-line, I think the very nature of the expansion to a trilogy undermines what makes that story powerful. Everything I love about this film – chiefly, paying off on Bilbo and Thorin’s arcs – could have been accomplished with less preamble, and perhaps made even tighter here. Were the focus there from the start, with the entire tale told in less time (whether that would be one long film or three substantially shorter ones), I think Jackson’s Hobbit could have packed a much heavier wallop in the end. The raw potential is absolutely there, and the general excellence of this final film is proof. The second question, however, is the one I find more important: Trilogy expansion aside, was this return journey to Middle Earth worth the effort? And to that I can only and unequivocally answer ‘yes.’ These were and are flawed films. Tremendously so at times. But I think cinema is better for the existence of Martin Freeman’s Bilbo Baggins, or for sequences like ‘Riddles in the Dark,’ or for incredible character creations like Smaug. It is better for having all 13 dwarfs, each of whom registered as compelling individuals at various points in the trilogy, or for giving us wonderful supporting characters like Bard or Tauriel. It is better for showcasing more of Peter Jackson’s directorial ingenuity, as in the ‘Barrels Out of Bond’ sequence, or throughout the eponymous battle in this last film. It is better for giving Howard Shore more time to stretch his musical legs with the sounds of Middle Earth, and for giving audiences three more opportunities to spend time in cinema’s most fully-realized fantasy landscape. Unsure as I am about the overall heft of the ending, it is worth it for moments like Bilbo saying goodbye to the dwarfs, and the unexpected profundity of the relationship they all shared over the course of these three films. The Hobbit is not, ultimately, The Lord of the Rings, and shall always exist in the shadow of its predecessor, the problematic follow-up to an outright masterpiece. But I am still glad these films exist, and that I have them in my life. They are not what I may have hoped for given my relationship with the earlier trilogy, but then, perhaps I was foolish for wanting them to be. The Hobbit has had many unique gifts of its own, especially here in this final chapter, and viewed as the minor companion piece to a major work, they have been a real pleasure indeed. The Hobbit: The Battle of the Five Armies premieres in theatres today, December 15th, as part of the Hobbit Trilogy marathon. It will open wide, in 2D, 3D, and High-Frame Rate 3D (the latter of which I would recommend), on Wednesday, December 17th.